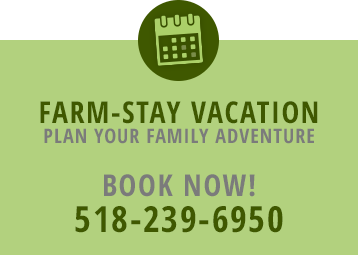 In the morning, when your family wakes up on your vacation on our farm, you’ll hear farm sounds like you hear in the movies…or maybe you’ll feel the tranquility that comes from being away from the hustle-and-bustle of the city and in the beautiful Catskills. You’ll breathe clean, fresh air that makes you close your eyes and smile, exhaling fully with the knowledge that the day will be different, different than anything you’ve experienced so far. The animals that have been waiting to be fed are anxiously waiting to see who will bring them their food. Will it be Farmer Frank? Or is it someone new? Is it someone cautious or someone who acts like a pro? As our guests will tell you, there is no need to worry, Farmer Frank or one of his staff will tell you what you need to know. You will have a memorable experience and it will be something you and your family will remember for a long time.